Countless businesses are born every day. In fact, the word “startup” has become commonplace. Existing in this environment can breed a kind of competitiveness that turns the focus inward. “How does your product stand out?” and “What is your brand identity?” are commonly proposed questions. While these are important questions to answer, what if there was a different way of approaching your marketing? 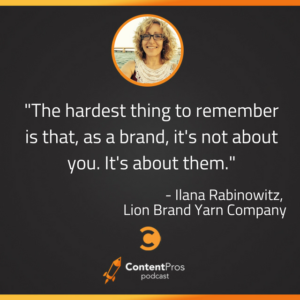 Ilana Rabinowitz of Lion Brand Yarn Company has an interesting perspective: “It’s about them.” By turning the spotlight on customers, and even using the company’s social media to promote them, she’s successfully pushed a company that’s been around for over one hundred years into an entirely new and younger market. There’s an often untapped power in engaging with cultural influencers, not just to influence customers, but to influence business as well. What’s your favorite yarn color? Black is Ilana’s favorite color and she attributes that to her New York upbringing. Okay, what’s your favorite season of the year? Fall is easily her favorite season. She even makes a point to take a ride every weekend to enjoy it! What is your favorite ice cream flavor or color? Anything with chocolate is okay with Ilana! 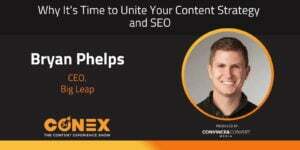 Randy Frisch: Welcome to the Content Pros podcast. I'm Randy Frisch from Uberflip, as always, I've got Tyler Lessard joining me from Vidyard, and today we're gonna jump into an area that I don't know if we've ever really hit on here on Content Pros, and that's influencer marketing, and that's how we use the people who are passionate about our product or the people who are passionate about the spaces that we're in to help build our brand, build our go to market, and at the end of the day, obviously this is Content Pros, we'll talk about how you can do that through content. So Tyler, I know this is an area you and I have been excited about, because as I said at the beginning, we haven't really talked about this much. Tyler Lessard: Yeah, you know it's an area that I think for those of us in B-to-B marketing, we don't think enough about, and I know our own team has recently started to amp up our investments in our community and influencer marketing programs, just seeing the organic nature of it starting to work, we thought, well, if we actually applied a focus to turning these market influencers and advocates into new lead gen sources for us, what could it become? So I'm really excited to have Ilana Rabinowitz here today from Lion Brand yarn company, and Ilana, it is, I was looking on the web site and you guys are coming up on your 140 year anniversary as a company, is that right? Ilana R.: That's right, 1878. Tyler Lessard: That is also, I think, a first for us, Randy. Randy Frisch: That's wild, a brand that lasts 10 years these days is pretty impressive, let alone one that lasts over 100. Tyler Lessard: So yeah, could you tell us, just maybe give us a bit of background on yourself, Ilana, and what you've been focused on, and how your own marketing role has evolved over the last number of years at Lion brand? Ilana R.: So I came here about 21 years ago, and I was brought to start a catalog business for the company, because that was really direct to consumer at the time, and somewhere around 1998 I saw that the internet might be a thing, and a lot of people questioned it, and there was some concern about brands having their own web site at the time, but I really have always been fascinated with everything digital, and so we started a web site and had actually, we were doing e-commerce in 1998, and then as soon as every possible digital platform came along that made sense for us, we started to engage. I think the next thing we did, we started with a blog in 2007, and we had a podcast at one time. We started on Facebook and Twitter and as things came along and they started to be places where people were giving their attention, we felt it made sense to be there. I had the good fortune of working for a company where they said, "go, try it out, do your thing, don't worry about generating any revenue from this," and it was the perfect way to start our own branded media, because we only concerned ourselves with what customers would be into, educational information, inspiring entertainment, and so we really started to build these platforms based on content that was interesting, and we had this strong basis for everything else we ended up doing later, where we wanted to convert. So that's kind of a short history of how we went from catalog marketing to where people's attention went, which was online. Randy Frisch: That's wild, I mean it's crazy to hear you tell that story because I think you said 1878, so 120 years later, dead on, if I'm doing the math from the story you told, is when you said, okay, we gotta reinvent ourselves and go to the web, and it's just amazing to think had you guys not embraced that as an organization, where would the company be today? And I think probably that's something these days as I was half kidding about, if we're not continually re-evaluating our approach now almost every couple of years, our company could completely falter. Ilana R.: It's true, and it's a great fear of mine that keeps me motivated to find out what's next, what's next, because you really don't want to be left behind using the typewriter and the telephone. We've really enjoyed learning from and communicating with consumers and so it's been great. I can tell you a fun story, it happened in 2005, that would never have happened without digital platforms, and in I think March of 2005, Martha Stewart walked out of prison and she was wearing a hand-crocheted poncho. And we started getting emails from customers saying, "oh, is that your pattern? Do you know about that?" And we took a look at all the news stories and we saw the yarn, which looked like our yarn, and we said, "Yes, we do have a pattern for that." And we immediately made a pattern for it, put it up on the web, and our website crashed the same day, because that's how many people were downloading it, and if people hadn't emailed us and we hadn't responded within minutes, that would never have happened, and it kind of made us see the value of free patterns as part of our strategy, and it was a very exciting time. Tyler Lessard: I think what's so interesting is in the time period that we're talking about there, I think for a business like yours, and I think we all have lessons to learn from this, is, correct me if I'm wrong, but were you a largely channel based organization, selling through retailers and such, but then when the digital era over the last number of years really arose, it gave you a new opportunity to communicate directly with your base and to build that brand directly with your audience through digital, through email, through social and other things, is that a fair assessment, or have you always had a one-to-one relationship with your consumer base? Ilana R.: No, I would say it's true that basically, I've always worked for companies that sold B-to-B, and whenever there has been a B-to-C element, what you learn from that is so valuable. When I first started at Lion brand, we got letters in the mail, and people would talk to us about our products and we had someone who would sit and respond to those letters, and so that was our only contact with consumers, and when we sold products, we sold to the buyer at a major chain, and what did the buyer want? What was the buyer interested in? And we didn't have the kind of data we have now to back up what we say when we go to speak to a buyer, so it's been really valuable in building what's 95% of our business, which is B-to-B. Tyler Lessard: So let's switch into the topic at hand around the influencer marketing world, and I think as a extension to the last comment, it feels like all the great touchpoints we now have in the digital community if you will is enabling us to identify those influencers, to activate them through different means, to reward them, and to make them really a part of how we go to market, so I'm curious how you think about influencer marketing. What does it mean to you and in your world, what is an influencer? What kinds of individuals are they? Are they people, are they brands, or how do you think about that? Ilana R.: So in the world where people knit and crochet, which is really the world we're serving, the influencers don't just love the product, they live it. It's their passion. It's how they spend many, many, many hours a day, and some of them have built up a very nice size audience and have developed a style of creating designs for their audience and how they speak to their audience, how they present themselves graphically, and the influencers we are working with, which is pretty much most of the influencers in this community, they're reaching an audience that I would say skews a good 20 years younger on average than our traditional audience. There's a lot of young moms and a lot of 20-somethings, and yet their content turns out to appeal to an older audience, because they're middle America, they're practical people, they're moms, and everybody is starting to relate to it. What we've gotten from our influencer network is, there's so much it's hard to describe. One is something we do with influencers which is probably unusual. We use them for product development, so a product would be a pattern to make a knitted shawl, let's say, and all the yarn that goes with it and the needles, and they're creating these designs based on their own personal lives and their own needs for making gifts for people or knitting for charity, and they're not picking from a vast array of patterns out there on the internet. They're creating things that relate to them, and so one of the things we do with them, other than the traditional people writing about us and linking to us, is we actually have them produce products, which are yarn and patterns, and we sell them on our website. We've found incredible success with it, so that's one area, and the other thing is, we look at the way they present themselves graphically, and it's turned our heads quite a lot. They have a very natural, authentic, down-to-earth style, and many of them are fantastic photographers who are developing their photography all the time, but unlike the brands, which are photographing in studios with professional models, their visual imagery is very relatable, and so we've learned a lot from the way they present themselves, and we've transitioned our own visual imagery and our own style and so we're kind of on our way to looking more like a brand that happens to be coming from a social network. So it's been very rewarding for us, and we support our influencers and share their content, and hopefully help them grow, and so it's not the typical "Here's some money, please plug us." It's we tell them when we've got a new product and we send them product to talk about if they're interested, but it's been a much more involved relationship, and we are influenced by them. Randy Frisch: So, Ilana, I want to jump in a little detail. It's a really interesting story and we hit it at the beginning of how long Lion brand has been in business, and to be honest, leading up to the podcast today, I was checking out the website, and I was surprised when I got to the home page and found as you've described them, these younger mothers, I don't want to put an age bracket on anyone on the page, but it's definitely younger than what I expected coming to the site, thinking about a yarn company, and as you've painted with a lot of examples today in terms of people taking inspiration from a Martha Stewart, or if you actually start to get into your content that I was looking at on your blog, a lot of it had fun gifs of little kids on entertainment shows, and I think I saw Amy Poehler and Tina Fey doing a high five along the way, right? You're definitely appealing to that, so I'm curious, because this is Content Pros and I think we're starting to understand how you're using influencers, but maybe you can talk about how that feedback from influencers has redefined your content strategy. Ilana R.: So I think it's the digital strategy that it's affected quite a lot. It's the product, the type of product we're developing, so for example, when our in-house team of designers is designing garments, most of the time they're doing it with a major retail chain in mind, and that chain may not have more than a few balls of a single color. They may not have the range of yarn that is needed for something that would be something spectacular on someone's wish list, and so it's affected the product, but it's also affected our content in terms of getting more casual. What is our look? What is the feel? What is our voice? And so it's mostly the way we appear to people online and we're talking more like, it's making it easier for us to talk more like an individual than as a brand, and I know it's kind of what people shoot for, which is don't sound like a company, don't sound like a brand. But it's not always easy to do, and now we kind of can get inside the skin of these people, and genuinely sound like an individual. We let people on our team talk in their own voices, and as long as it's within the general framework of our brand, it seems to work pretty well. We've been trending towards that more and more over the last six months to a year. Randy Frisch: That's really interesting. 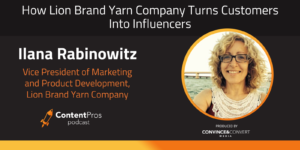 We're gonna take a quick break here on the Content Pros podcast, and then we'll be right back with Ilana Rabinowitz, talking about yarn and talking about how we take these feedback from influencers and spread it throughout our entire team. Right back after hearing from these sponsors. Jay Baer: Hey everybody, this is Jay Baer from Convince and Convert reminding you that Content Pros is sponsored by Uberflip, a cloud-based platform that helps marketers like you create personalized content experiences to showcase the content you've created. You, not IT, you can create engaging content hubs that your audiences will love. I use it all the time. My team uses it all the time. With Uberflip, you'll deploy content faster, accelerate your lead gen, and enable your sales team with personalized content throughout the sales cycle. Go to Uberflip.com/pros. Uberflip.com/pros to find out how you can be a content pro by showing your company that the content experience matters. This show is also brought to you by my friends at Vidyard, the new generation video platform, that helps you unlock the power of video today. Love, love, love Vidyard, use it all the time. Super easy, interactive, personalized video experiences. You can boost your online conversion rates, track the true performance of your video content well beyond the view count. Visit vidyard.com today to see how you can use video to deliver better results across all of your marketing programs. Also want to remind you that my team and I at Convince and Convert have a brand new free e-book I'd love for you to take a look at. Go to bit.ly/brokencontent. That's bit.ly/brokencontent. 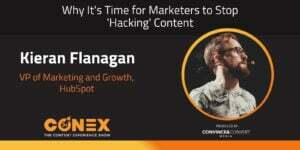 It's called The Four Ways to Fix Your Broken Content Marketing, put a lot of work into it, I think you'll love it. Thanks as always for listening to Content Pros. Now, back to the show. 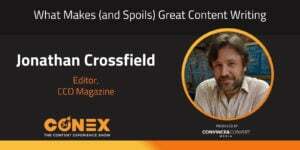 Randy Frisch: We're back on Content Pros. We're chatting with Ilana, and we're talking about how we take all of the feedback from our influencers, and then we bring that into our brand and bring that into our voice, and I was really interested as you were talking about that, Ilana, because I was actually also checking out some of your channels to see, is what you're telling me actually holding true? And I found it pretty interesting. Take Facebook as an example, where if you check out and the Lion brand yarns experience there, it is fun as you said. It's very young and relatable. I think there was one that I saw earlier that talked about how old were you when you first learned to knit at the first point, right? And it's very much kind of like a survey to get people to engage with and get involved with, and I was amazed to see that you had like 27,000 people who just liked that one post, which is showing that you've got a lot of engagement from a strong following. So I'm curious in terms of how you get to that point. What I found interesting on your team, you have a director of influencer marketing. Is it on them to feed those insights over to whoever's handling your social channel from a content perspective? Ilana R.: We all kind of look at it together. The director of influencer marketing is in touch with these influencers on a regular basis, and believe it or not, it's partly the relationship, which is very important, and one of the things we do is we don't manage our influencers. We give them plenty of leeway and he's very good at that, but it's really a very complicated thing to manage the influencer program. There's a lot of product that has to get in and out, and because we're using them for product development, managing that process, so he's great organizationally, he's great with the relationships, and that's pretty much what he does, and then it's not a big team. We all sit at least twice a week together and look at what's coming down the pike to everyone on my team is someone who knits and crochets, and some of them are very avid knitters and crocheters, so when they saw the influencer program that we just launched, which is our fall/winter collection, which is a combination of influencer and in-house designs, they immediately wanted to make these things, and so they said, "Okay, let's start a knit along," which is like a virtual group happening on the blog. Three of them are going to be making some of these products, talking about them as they work on them, helping people through the process, and it might go for four, five, six weeks for everyone, and so we kind of play off of each other. Tyler Lessard: When I think about influencer marketing in our world and in being a B-to-B company in software, for example, I'm curious because I think about it as identifying who are those influencers out there, nurturing them, which is through a variety of things that we can do from a relationship standpoint, and then activating them in the market, and a big part of that activation for us, tying it back to the theme of content, is to get them to share our content, because we know if they can help us amplify the messages we're putting out there, the blog posts, the videos, the guides, whatever they happen to be, those can trickle down into their audiences, and their other activation points that we look at. I'm curious, is there a similar framework you think about in terms of how you manage those influencers, and then how do you relate it back to a content marketer? How can a content marketer effectively leverage that influencer community, do you have any thoughts there? Ilana R.: Well, we send them product, and what they do with that is all their own, so we're not dictating that to them. Occasionally, we'll have a major retail chain that needs a push for a new exclusive line that we've got with them, or new yarn that's in their store, and we will ask some of the bloggers to go into the store to write about it, and we'll send them samples and ask them to promote something that we're particularly interested in at the time. I think one of the best things we do is not get too structured with the influencers. We send a newsletter out to them every week, here's what we're promoting, here's what's interesting, can you be a part of this? And then they choose to promote it. We get reports every week about the kind of traffic we get from influencers, and it's often really huge, and it's often what they've done with our product, what they've created from whole cloth, so to speak, with our product. But we're not dictating to them that much what to share, except telling them, "Here's our calendar, if you see something that appeals to you, go for it." Tyler Lessard: I think it's amazing that in your world, they've become such a phenomenal source of content. Frankly, I'm jealous about how you guys have built that out, because I think about our own team, and wouldn't it be great if we had this community of influencers who were creating this kind of content, whatever kind of content it could be, and really pushing it out into the market as something that ultimately ties back to our brand, so it's a really interesting play. Ilana R.: Yeah, one of the other things that we call them mini-influencers, is our customer generated content, and that's another area where we've learned a lot. We use a lot of it on Instagram, if you've seen our Instagram feed, we're pulling a lot of customer content in there, and we've learned a lot from them about what works on Instagram, because they're people who are actually individuals, and one of the things that we've learned is that what you call works in progress are really popular on Instagram, so it's not the finished sweater, and it's not a ball of yarn for sure, but it's something halfway on the needles. It's 12 rows in, and there's a cup of coffee sitting next to it, so it's a sort of in the moment, in progress, capturing a moment in time, and they're fantastic at that. It's very time consuming to create those little vignettes, and if we had to do it all in-house, it would take hours for each Instagram post, but our customers are creating them and we're sharing them with their permission in our Instagram feed. Tyler Lessard: Yeah, that's another great example, and in our world, we've started to do some similar things to give another perspective on that. I know in your world you've got physical product, which I think lends itself really well to being able to do imagery around it and things like that. In our world, because we're a software company, it's a little bit different, but we looked at what are the challenges our community was facing, was we've got a tool for recording and sending personal video messages as part of a sales process or a marketing program or whatnot, and we've found just through listening and engaging with the community, one challenge they were facing was just ideas and best practices for what kinds of videos should I create? How should I look on camera? Should I wear a funny hat? What are the tricks to get people to pay attention to it? I think in a very similar way we started to source from the community and encourage people to share some of their own examples of videos they've done that have worked well, ones that didn't, and we've really started to focus a community program around that as a way for people to, both with the community as well as out on social, as a way to share some of that knowledge, and so I think even for a software company like us, there's a corollary, and I think a lot of businesses could come up with creative ways to encourage their audiences to create some kind of content that helps show how your product is solving a problem, or how they're doing something interesting in their day to day life with the solution that you offer. Randy Frisch: Tyler, I think that's so right. At the end of the day what I think you're really hitting on is just giving opportunity for your army of potential advocates to engage with you, right? That's what people want, they want to communicate, they want to have conversations with you, they want to feel part of the brand. I think, Ilana, that's something that you guys have done such a great job with. We try and do that even ourselves, as you said, it's harder with software, Tyler, and we feel that sometimes, and you've probably got one of these. We have these silly swag items that are pink headbands for Uberflip, right? And I know you are. Tyler Lessard: I'm wearing it right now. Randy Frisch: And it's funny. We've had fun campaigns where we just had people posting photos of them wearing those. Unfortunately, I don't know if they've been knit, Ilana, they're still pretty slick, but the idea's just to call on all these people who believe in your brand, believe in what they're doing, and I think it adds that legitimacy that you've been talking about a lot today, Ilana. Ilana R.: Yeah, I think it's really, the hardest thing to do is to remember as a brand that it's not about you, and it's about them, and so we give them center stage and they have insight, because they are them, that it's really what they put out there is completely honest and perfect, and when we focus on them and what they do and what they come up with, that gives us the best results. Randy Frisch: So we're just running low on time, but we always like to get to know our guests a little bit, and we always try to change this part of the show up. I took a couple of notes on some rapid fire questions, so we're gonna hit you with a bunch of questions just to get a bit of your personal taste, and I feel like we've talked so much about yarn and knitting, so I'm gonna start off with, first of all, a basic question before I get to the rapid fire. Is there a difference for those of us who are laymen between crochet and knit, and what is that? Ilana R.: Yes. Knitting is done with two needles, and crochet, and there's a particular way you create the fabric and the stitch, and crochet is done with one hook. There's actually, some people do both, but it's almost like two different religions, and when we promote crochet patterns, the knitters say "You never give us enough attention," when we promote crochet patterns, the knitters say the same thing, and it's really funny. They're two different ways of working with yarn, and they create different kinds of results, but now, as time has gone on, it used to be crochet was kind of an old-fashioned hobby and knitting was the more hip, upscale, and now the knitters have found all kinds of modern ways of using yarn, including, you may have heard of yarn bombing, and they are creating yarn on outside, to decorate outside installations and telephone poles, and so it's become a very hip thing. Randy Frisch: All right, so speaking of hip, and this is where we're gonna get into the rapid fire. We've only got three or four here. So the first one is, what is hotter these days, crocheting or knitting? Ilana R.: It depends who you are. So the very, very- Randy Frisch: This is rapid fire, come on, we need- Ilana R.: Okay, rapid fire, okay, sorry. Randy Frisch: I know it's hard to be- Ila na R.: What's hotter? I can't say because I'm gonna offend someone. Randy Frisch: That's the fun of it, right? Ilana R.: It really is a totally different thing. Randy Frisch: All right, [inaudible 00:29:46] political answer there. All right. What's your favorite yarn color? Ilana R.: Black. I'm from New York. Randy Frisch: All right, fair, fair. Okay, what's your favorite season of the year? Ilana R.: Fall. Randy Frisch: As far as, oh, okay, fall. Ilana R.: Easy one. Fall, I love it. I take rides every weekend. Randy Frisch: Fantastic, all right. We'll finish with fun. We're talking about colors, we think of the fall colors, what about favorite ice cream flavor or color that you go with? Or color that's associated with it? Ilana R.: Anything with chocolate is good with me. Randy Frisch: Sounds good. Sounds delicious. This has been a ton of fun, Ilana, thank you so much for joining us. It was really a different perspective than I think we often get here on Content Pros, understanding how to leverage our influencers to drive the types of content, the types of messaging that we're putting out as marketers, and it's been really interesting to understand how not just you over the tenure you've had with the company, but the company as a whole has adapted for what is it, 140 years, you said? Ilana R.: Yep, this January. Randy Frisch: Pretty amazing. Well listen, we look forward to having you back for the 150th year anniversary of the company, and I'm sure you will be continuing to set trends. On behalf of Tyler at Vidyard, I'm Randy at Uberflip, this has been the Content Pros podcast. Please let us know what's been working for you. You can find all the other Content Pros podcasts at ContentProsPodcast.com, or on iTunes or Stitcher, and that's where you can leave some of those reviews and feedback for us to let us know what can help you in your content execution. Until next time, thanks so much for tuning in.